SBR-02CR-Metal is fully waterproof standalone Proximity access Controller or a Wiegand output Reader, which supports up to 10 000 cards. It is so easy to add or delete card users by using Infrared remote control programmer. In additional, with infrared remote control programmer, you can add or delete cards directly by inputting card number. The infrared remote control make the device not only have alarm, protection, two units interlocked, anti-passback function but also can make two units interlocked, add and delete the user on the remote control key directly. 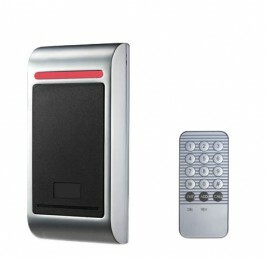 Besides, it has low power consumption design, anti-theft alarm, door release button ect. , all these make it convenient, safe and reliable.